Travel Hair Diffuser, Segbeauty Collapsible Portable Hair Diffuser Easy for Travel, Universal Blow Dryer Attachment for Natural Wavy Fine Thick Hair, Suitable for Nozzle D1.6'' to 1.8'' - Black by Segbeauty at ETCF Blog. MPN: Seg-B160078B. Hurry! Limited time offer. Offer valid only while supplies last. Smart Folding Design ---- Built with strong silicone, this hair diffuser is able to collapse and fold for travel and storage needs, sliping easily into your bag or the corner of your overstuffed suitcase, making this diffuser one-of-a-kind. Promote volume and height for your hair. This hair diffuser is created to give your hair a boost in vibrancy and optimal health. This heat resistant diffuser features a cool touch silicon surface, ensuring that hair can be styled with heat up to 450¡ãF (230¡æ). The detachable filter net is easy to be removed and cleaned. Plus with a warming design, there could use the sponge or cotton ball soaked with some essential oil to achieve better results. It is designed to fit most hair dryers, but it not universal, so be sure to research and see if this diffuser will attach to your current hair dryer before purchasing. SUPERIOR GUARANTEE: Each of our Segbeauty Hair Diffuser comes with a 30-day money back guarantee. Simply return it within 30 days for a full refund if any quality problems. 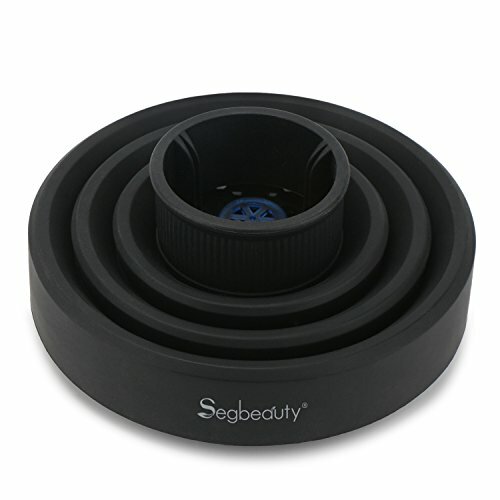 If you have any questions about this product by Segbeauty, contact us by completing and submitting the form below. If you are looking for a specif part number, please include it with your message.